The trial lawyers of Callahan & Blaine have established a record of excellence in jury verdicts and settlements that has gained the firm a national reputation in business, corporate and personal injury litigation. Contact our office in Santa Ana to learn about our client service values and ideas for the resolution of your dispute. 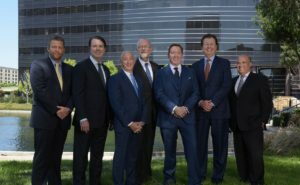 With about 25 attorneys, our firm is big enough to meet the challenges of the most complex commercial disputes. At the same time, we’re small enough to offer highly attentive service to clients ranging from individuals and closely held businesses to Fortune 500 corporations. We keep our clients fully informed and engaged at each stage of every case. Our refusal to rely on the labor of junior associates reflects our leadership’s judgment that our clients should not subsidize professional apprenticeships. Every lawyer at our firm is a highly accomplished and experienced advocate whose work stands on its own. It generally gets the job done, too — most often in a way that far exceeds our clients’ expectations. We also believe that a good trial attorney should be able to pursue claims, defend claims or both as our client’s interests demand. We therefore resist characterization as a plaintiff’s or defendant’s firm. In fact, many of our cases require us to defend our clients on one set of claims while attacking for an affirmative recovery on one or several claims. We also offer transactional and operational advice to closely held companies and family businesses throughout Orange County and Southern California. Many clients depend on our lawyers to serve as their general counsel. For more information about the scope of our practice and our approach to client service, contact Callahan & Blaine in Santa Ana.